Sideshow Toy - how to make friends and influence people. Last week, Sideshow Toy made a major announcement. 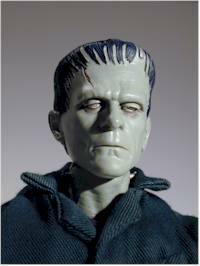 Sideshow are the manufacturers that have brought us the wonderful 8" Universal Monsters the last couple years, and have just started to move into the 12" market with Frankenstein, Wolfman and Spinal Tap figures. Many toy collectors were hotly anticipating their releases for 2001, with licenses like Buffy, more Universal Monsters, Young Frankenstein, and several generic lines like gunfighters, civil war figures, and WWI figures. - All new product for 2001 would be sold not through mass retailers, like Toys R Us or Wal-mart, but through smaller vendors and from Sideshow direct at their on-line store. - All new product for 2001 would be sold as 'limited editions', with specific, announced run sizes. Sideshow claims this is all their idea. While that could possibly be the case, it is more likely that poor buyer response from the large changes dictated the change in marketing plan. In any event, many collectors are quite upset by this news. I believe that niche marketing and sales such as this is possible, and it's been proven by other companies in other markets. It requires a very hands-on approach to sales and marketing, and it will require that Sideshow get extremely close to it's customers. There will be no middle man to stand between them and customer service, communications, and opinion. Some folks are upset that they will have to purchase these products through smaller retailers. This usually means that they won't be able to see the product in advance, but rather have to pre-order from a dealer on line. This will hurt Sideshow in many cases, since seeing an exceptional product can be part of the marketing scheme itself, and if you don't get that 'face time' with the toy, sales can be influenced. On the other hand, there are great advantages to selling through the small businesses, including the ability to use materials that otherwise might not be allowed. We are much more likely to see obscure characters when a company uses this marketing technique, although it could be argued that the Playmates people have gotten away with selling some pretty damn obscure characters in both the Star Trek and Simpsons lines. But the dissatisfaction over this move to limited sales channels pales in comparison to the announcement of the limited quantities of figures themselves. Collectors HATE limited editions. Investors love them, although the reason for that is completely unknown. There is no example of a product that was produced specifically as a limited edition collectible that ended up being worth big bucks - if you have one, I'd love to hear it. But investors still believe that if something is an announced collectible, and it has a specific size to the run, that it will be worth more than the same figure, the same number produced, but no big announcement of any sort of limitation. In the short term, the investors can be right. False demand is created for limited edition figures because of nothing more than the proclamation itself. People who truly want a Young Frankenstein figure are trampled by the investor or dealer with dollar signs in their eyes, lusting after that one of 5000 figure. The figures are snapped up, and the dealers and investors attempt to gouge the collecting public for higher prices than the suggested retail, hoping to make big money and retire early. Sideshow will lose control over the suggested retail price, something that doesn't happen when selling through Toys R Us. Once Sideshow has sold the 5000 or 7500 they've manufactured of a figure, the 'retailers' will be allowed to set what ever price they feel appropriate, and I believe that if you do not pre-order these figures early, you'll be paying more than the $25-$30 you've come to expect. If collectors become frustrated early in the process, they will give up on the figures. Once they do that, the investors and dealers won't be able to get rich off the figures, and they'll drop their support as well. This can spell absolute disaster for a company. So how can they possible market their figures this way and still make a profit? It might behoove them to look at how others are doing it successfully. Take two examples - Dragon and Ty. Both of these companies produce 'collectible' toys. Both have done so successfully, and neither has announced 'limited editions'. Instead of announcements up front, they make them on the back, by retiring figures or beanies. In this way they manufacture only as much as they think the market can reasonably bear, and then they retire the product for something new. Sideshow could announce that they will make a certain number of initial figures. By telling customers that they will run 5000 of a particular monster, they give them a heads up that they should buy early if they really want to be assured that they'll get one. But there's no reason to close the door - if demand warrants that another 1000 or 2000 of a figure be produced, Sideshow should be more than willing to produce them, limited edition be damned. Unfortunately, doing it the way they are removes that possibility, and forces the collector to buy early, often without seeing the final product, just to be assured that they can get one. A mistake that people make is believing that supply drives demand. They remember the cute supply and demand curves from high school economics, but forget the real relationships. Supply very rarely creates real demand. Because something is in short supply does not mean that more people want them or that there is a demand for more to be made. Demand - the quantity of some item that can be sold to the real buyers, those that actually want that product versus those buying it to try to resell it for profit - is not influenced by how 'rare' the item is. They want it because they are fans. Yes, supply can drive price, but it doesn't drive demand. Demand SHOULD drive supply, however. The greater the demand, the more should be manufactured. A product should be manufactured to meet the demand at its equilibrium price. Any attempt to manipulate a free market by artificially controlling demand will be met with great dissatisfaction by those creating the demand. And in a free market, when supply doesn't meet demand and a shortage is created, what happens? All things move toward equilibrium, and if supply can't rise to meet demand, demand will fall to meet supply. If you'd like to express your opinion on this subject, I suggest emailing Tom Gilliland at tom@sideshowtoy.com.